This is wood. Nothing like stating the obvious huh. But this isn't just any wood. It's special wood. 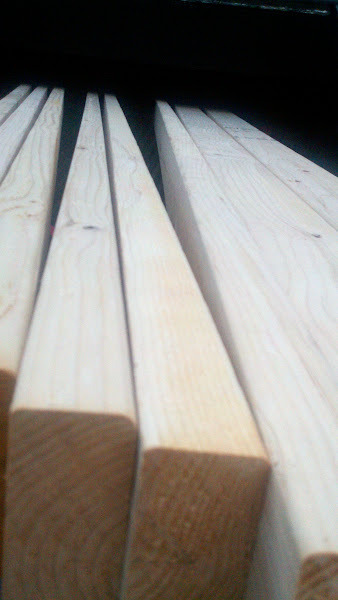 This is the wood that will provide the structure for the last remaining wall of my greenhouse. The wall that will house my door. The door that enters into the greenhouse, my zone, my space, my new adventure. This special wood means we are drawing to the end of the installation because it currently resides at our house. This wood means I will be able to have a greenhouse to winter plants in or at least try. This wood means, I will be able to start seeds early. This wood means I will have a place to pot plants and to store my garden tools. This wood also means that I need to get off the computer to prime and paint otherwise all of the above will not happen. Have a great weekend! New greenhouse, how exciting! Now get to work so we can see this beautiful greenhouse when it's done! :-) Have a good weekend yourself! Have fun painting! I hope you post pictures once it's complete! The suspense is killing me! :) Have a good weekend!